Is black the new brown? In my house it is! Well, sort've. I still adore my beloved, simple, nutty, fluffy, go-to short-grain brown rice. But black rice also called "forbidden" rice or purple rice is my new must-try fave! Here is why: It contains all the fiber, texture and 'less processed' goodness of brown rice. But in addition to that, it also has antioxidants, the same anthocyanin antioxidants found in blueberries. 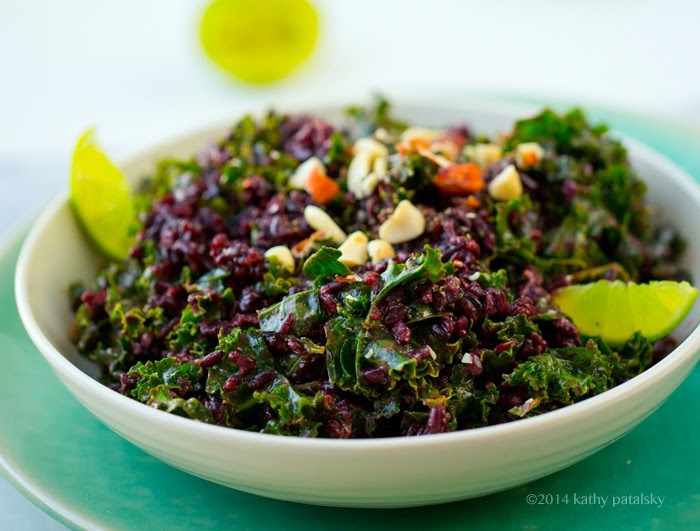 So today I bring you a super easy recipe containing a few superfood favorites: my easy Peanut-Kale Black Rice Bowl. 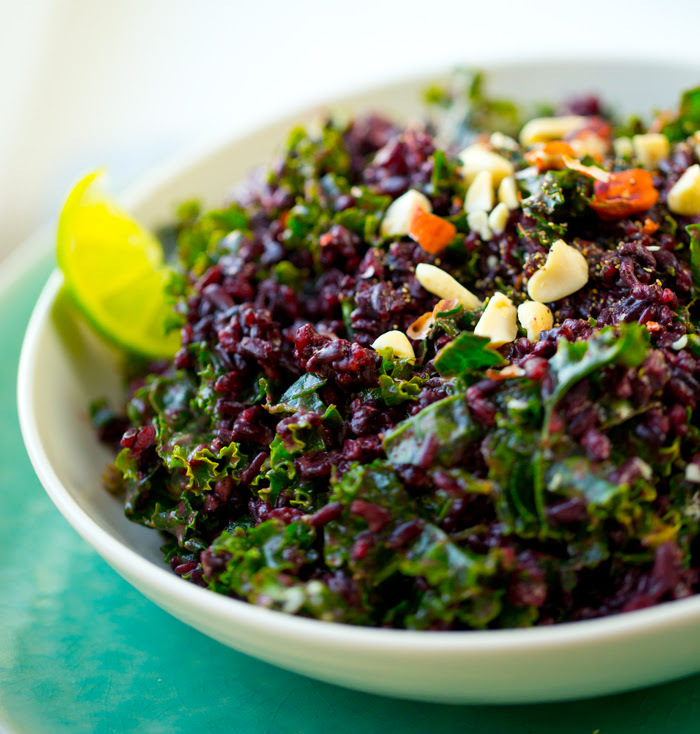 Head to your local grocery store or health food store, find some black rice and get cooking!.. More on those antioxidants.. More than a few sources say that black rice may even contain MORE antioxidants than blueberries. Crazy, yes? OK, so if you look at that study, they compare one spoonful of black rice to a spoonful of blueberries. 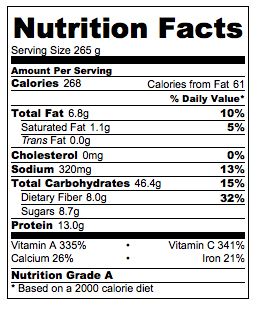 So calorie-wise, I'm not sure what contains more calorie-per-calorie. But still. I am super excited about this new ingredient fave! Can you tell? Black Rice Inspiration? I have been ordering a seasonal special at Real Food Daily here in Santa Monica called "The Essence." Anyone try it as well? OMG. It is crazy delicious. It contains this creamy cauliflower puree with pomegranate seeds speckled on top. Some maple-y roasted brussel sprouts and then a giant balsamic portobello mushroom overflowing with black rice. The entire dish is spectacular, but that purple, black (I confuse myself!) 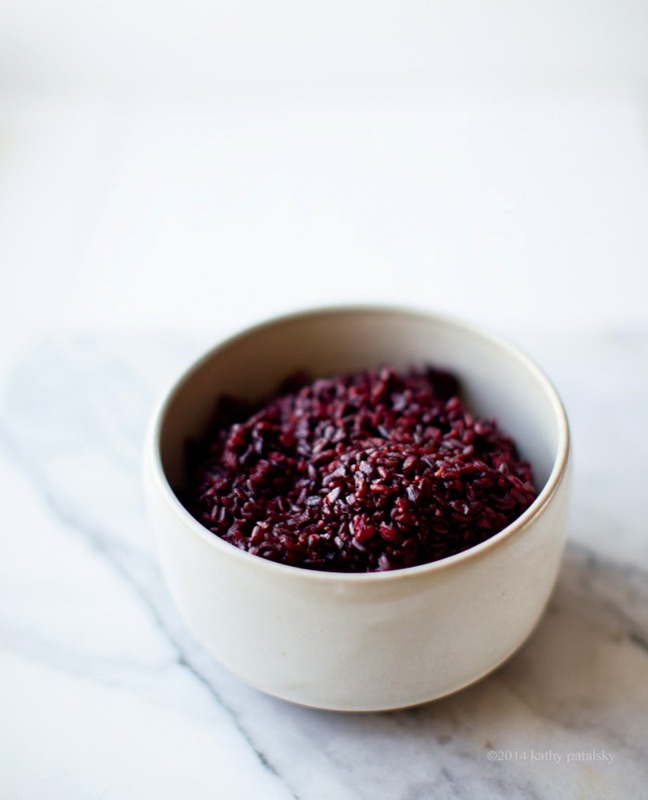 "forbidden" rice is what makes the dish a real filling meal. In fact, my husband who used to hate all grains (I know) now likes rice, but LOVES this purple stuff. So I knew I had to start making this stuff myself. How to cook black rice? Easy! You simply add 1 cup of rice and two cups of water to a large soup pot, add a pinch of salt, bring to a boil, then reduce heat to a simmer. Cover pot with lid and allow the rice to simmer for a good 45 minutes, or until tender. Black rice can be used in any way that white or brown rice can be used. It has a very tender, nutty and chewy texture that I love. It is a bit heartier and heavier than fluffy white or even brown rice. Perfect for a hearty grain addition to any meal. 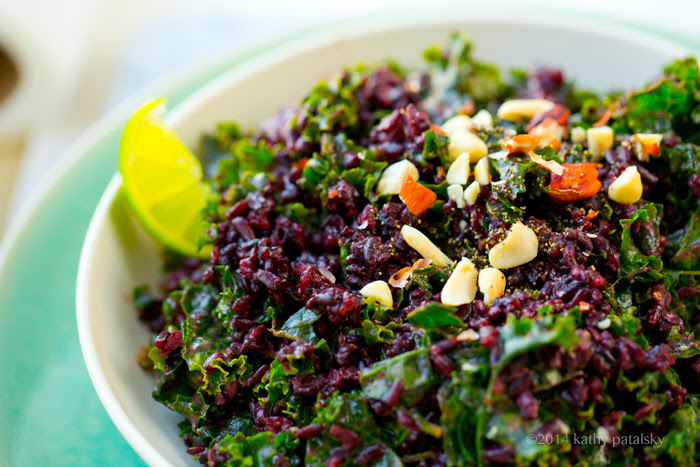 Peanut kale is a favorite of mine, so paired with this tender purple-colored black rice I was in heaven. I added some simple lime juice and maple syrup to accent. 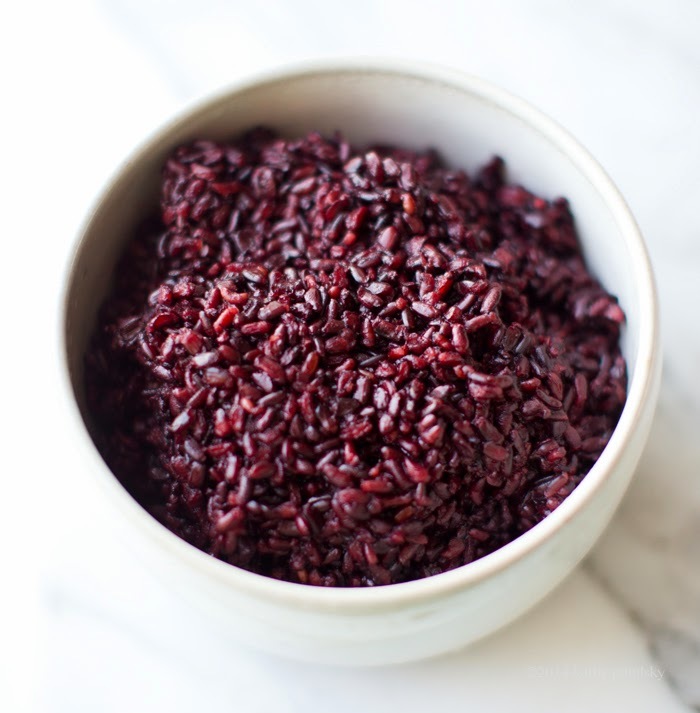 Do you love black rice? How do you use it? 3. Combine dressing ingredients in a small cup. Warm the dressing tin the microwave for about fifteen seconds (this step is optional but encouraged!). 4. 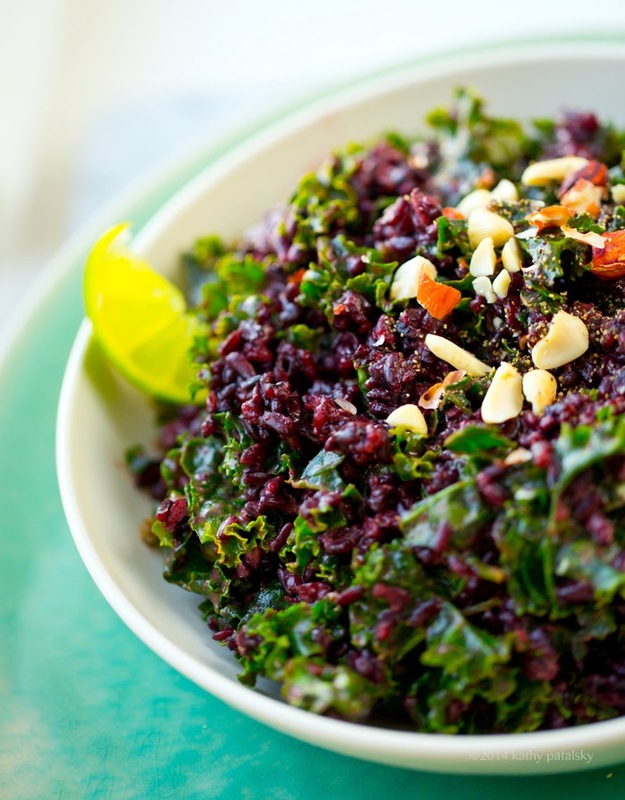 Place all washed, dried and torn kale leaves in a large mixing bowl and pour warmed dressing over top. Massage the dressing into the kale. The kale should wilt a bit and soften as it becomes marinated with the peanut dressing. 5. Fold in the rice. Toss well. Serve wit crushed peanuts over top and lime wedges.